Kicker subwoofers are a good choice if you’re looking to upgrade your existing car audio system. It’s one of the more reasonably priced brands out there. You’re not breaking the bank, so to speak, when you get the best Kicker subwoofer for your vehicle. It’s something you should get if you want to add enough bass to your car audio system but you don’t want to feel guilty for splurging on one item. However, you should not expect too much power from Kicker subwoofers. While most of these subs sound great, Kicker isn’t really known for models that deliver ground pounding bass. Let’s just say that if you install a Kicker sub, the driver in the next car won’t be opening his window because he won’t really hear whatever you are playing in your vehicle. This is a set that not only includes the 12-inch subwoofers, but also comes with a 500 watt mono car amplifier and all the wires you need to set up your car audio system. This subwoofer should make your passengers hum along to your favorite tunes, as they would be able to feel every bass note. Say what you want about these mid-range subwoofers, but one thing you can’t take away is the good build quality of Kicker subs. This model is a good example. Its rigid injection molded cone stays in shape even during extended play. Behind it is a 360 degree back bracing and a sturdy steel basket. Most of the reviewers on Amazon.com have good words for this sub. They agree that it provides accurate response when playing at low frequencies. They say the bass is clean and clear, although it tends to suffer in quality when the volume is raised. Most of those who commented on this product say they installed the sub on small cars like Chevy Camaro. Installation should be easy, especially if you have some experience in setting up a car audio system. After all, the kit has everything you need to install the subwoofer, including an appropriate amplifier. If you feel the 10C124 doesn’t deliver the kind of bass you would want, then you can check out this more powerful sub. It comes in a rugged, ported enclosure. With its dimensions of 17.5 inches x 16 inches by 14.5 inches (width, height, and depth), this is by no means a compact subwoofer. You may have to look for decent amount of space for this big boy. Most reviewers on Amazon.com say they put this at the back of the seats. Some installed this in the trunk.It’s also heavy at nearly 30 pounds so you may want to have some help when you install it. Compared to the preceding model, I find this sub having more power. I once had the chance to drive a car with this subwoofer installed. It really bumps hard. I remember feeling every beat in my chest while driving. This sub is very sensitive to music quality. So whether you are into heavy metal, rock, and hip-hop, you can appreciate the music blaring from the speakers. However, like the other sub I mentioned earlier, there’s some distortion noticeable when you increase the volume levels. For best results, I suggest that you pair this with at least a 500 watt amplifier. Like most of the subwoofers in this list, this 1000 watt car audio subwoofer is affordable and packs decent punch. This subwoofer comes in a kit that includes a 3000 watt mono amp. It’s a good choice if you are a neophyte in setting up car audio, as you don’t have to shop for an appropriate amplifier to the sub. The subwoofer in particular can handle up to 800 watts RMS. Just like what you would expect from Kicker subwoofers, the 40DCWR102 has a rigid, polypropylene cone. It can stay in shape even during extended and intense play sessions. You’ll be able to hear clean and accurate bass with this sub. The sub has extensive venting in its heavy steel basket. This is designed to keep the sub cool even during long playing sessions. It’s safe to say that you can rely on this sub to give you decent bass for long hours. However, not a lot of reviewers on Amazon.com are happy with the amp that is included in the product package. The consensus is that the 3000 watt amp not really reaches that peak, with many saying it is only about 400. They also say that the amp is so cheap that it has a tendency to overheat. Another common complaint is the quality of the wires included in the package. Most reviewers say that it is cheap. Aside from those drawbacks, there isn’t really any issue with the subs themselves. I say that this is one of those subs that give you value for your money. This package includes a 12-inch subwoofer and a Kicker 2010 C12 single 4 Ohm 12 inch subwoofer. The 12-inch truck sub box would take up some space in your car or truck, what with its dimensions of 20 inches (width), 15 inches (height), 5 inches (top depth), and 7.5 inches (bottom depth). It is designed to fit behind most back seats. The box is made of high quality MDF and looks good with a high quality gray carpet.The other subwoofer, a C12 sub, has peak power of 300 watts and 150 watts of RMS power. With a mounting depth of less than six inches, this sub should fit in the door panels of most trucks. It has a vented pole piece designed to dissipate heat and a super rigid, injection molded cone. With dual subs to pair with your existing car audio system, you can expect your daily commute to become more bearable. According to those who have installed these two subs in their cars, I can add a good amount of bass. Others describe the bass to be tight and punchy. The consensus is that there’s no distortion at all even if you increase the volume level to high. One reviewer even commented that the subs broke his car windows, which may be an exaggeration but only underlines how much power you can expect from these subs. Despite those good qualities, these subs also have its drawbacks. Some reviewers complained that the screws are not tightened. Other screw locations have no screws. Another good quality of this sub is how easy it is to be installed. It’s called a drop-in sub, meaning you don’t need to modify it at all if you intend to use it as a replacement to your car’s factory sub. You simply have to wire it up in 2 ohm and secure it using the provided self taping screws. Rounding out our list is this 12 inch subwoofer that is part of Kicker’s Comp series. It’s another reasonably priced subwoofer with decent bass. It should give your existing car audio system a big boost. I recommend this to people who want a sub that can handle plenty of power, but are hesitant to spend a lot of bucks. This subwoofer has the same cone that the other Kicker subs have. The said cone is tough, made of polypropylene that remains rigid even when the sub is used for hours. It can also resist heat thanks to the extensive venting in its heavy steel basket. Like most of the models in this list, this will prove to be a decent addition to your existing car audio system. It is more of a starter set-up. I suggest you pair it with an amp of at least 500 watts. It will shake your mirrors a bit, but not too loud for your neighbor will shout at you for disturbing his sleep. Basing on the reviews that I have read on Amazon.com, this subwoofer works best if you enclose it in a sealed enclosure. I haven’t read any comments indicating that it needs a lot of time for break-in as well. There have been comments questioning the durability of this sub. One reviewer mentioned that he blew out his subs in less than a month. But it is easy to dismiss that as an isolated case. There you have it--- five of the best subwoofers from Kicker. 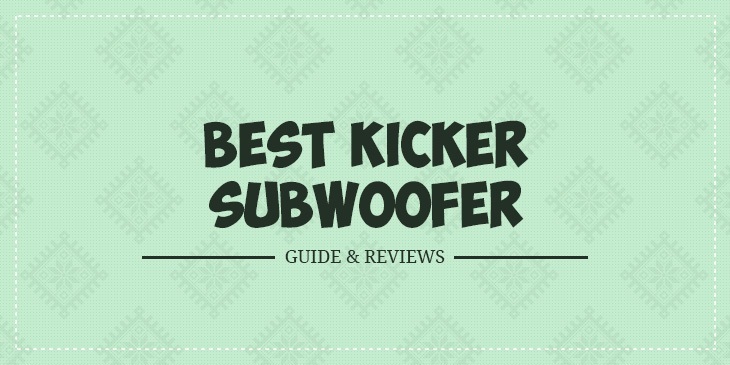 Like what you would expect from subs with the Kicker logo, all these subwoofers are well-built and should last long. There may be reports of subs blowing out after a few months, but generally speaking, Kicker subs are considered to be durable and reliable. Again, just don’t expect Kicker subs to shatter your car’s windows. These subs aren’t just in the level of a Kenwood or Pioneer subwoofer. But if there’s one thing that these subs have over their more glamorous rivals, then it would be their budget-friendly price. Simply put, Kicker is the brand you should trust if budget is a concern.